Its becoming something of a trend for Pixar to focus its sequels on the sidekick characters of their films. On one hand, this makes sense, as original films often end with a good deal of closure, and the stories of their main character and plot don’t lend themselves for particularly interesting continuation. Then of course there’s the fact that the sidekicks tend to be the most popular characters in any Disney or Pixar movie. From the days of the Seven Dwarfs all the up to the present with Frozen’s Olaf, the “Disney sidekick” has become something of an archetype of its own, and regularly provides a film’s most iconic character. On the other hand, focusing a story on a character that wasn’t intended to be at the center of things can be a risky move, as was proven with Cars 2, which showed that Mater was a character created solely to provide comic relief, and could not carry a story as its central focus. Thankfully, Dory is far more of an actual character than Mater ever was, and showed a wider range of actions and emotions within Finding Nemo. And her presence at the heart of its sequel only reveals what a compelling character the regal blue tang really is. While Finding Dory could have simply been a cash-in sequel banking on the character’s popularity, it is evident from the very first scene that Pixar and director Andrew Stanton brought their A-game when developing the sequel to what is likely the studio’s most beloved film. The opening immediately gives Dory (Ellen DeGeneres) a whole new depth. Her short-term memory loss, which was a source of comedic relief in the first film, is now revealed to be a far more serious disability, as the scene depicts a moment from Dory’s childhood where her parents try to teach her different ways to deal with her problem should she be separated from them (to varying degrees of success). As anyone who has seen the first film knows, Dory is eventually separated from her parents, with her memory loss making her forget where they are and, eventually, who they are. It’s an effectively emotional opener that is especially notable for how it turns two comedic aspects of the first film into great backdrops for its own story. Along with Dory’s recurring memory loss, her passing reference to not knowing the whereabouts of her parents was little more than a punchline in Finding Nemo. Yet that small reference and Dory’s forgetful nature have been turned into something deeper, and successfully manage to carry this long-awaited follow-up. After the first scene, the film picks up one year after the events of the first film, with Dory living among Marlin the clownfish (Albert Brooks), his son Nemo (Hayden Rolence) and many other fish. One day, while spending the day with Nemo and his friends as they visit a stingray migration for a field trip, Dory is reminded of a past event in her life, brining back memories of her parents in the process. She then remembers that she was searching for her parents before she ran into Marlin during the first film, and begins missing her parents all over again, and thus continues her search for them. Admittedly, the events that lead into Dory’s continued journey to find her parents feels a little rushed, but it is a small price to pay for when said journey pays off. Marlin and Nemo accompany Dory on her adventure, which at first almost seems to be a retread of the events of the original film as they begin their search across the ocean. But it is soon revealed that Dory was not always from the ocean, and that her parents still live in a marine life institute in California, where she was born. It’s in this marine life institute where most of the film’s action takes place. Finding Dory manages to greatly differentiate itself from Finding Nemo largely due to the change in setting. While the ocean certainly provides plenty of room for multiple adventures, this sequel is wise to change things up. While Finding Nemo was more akin to an on-the-road adventure, with a new character around every corner, Finding Dory is more focused on the main characters and their stories than it is on the scope of the adventure. That’s not to say that no new characters come into play. Joining Dory, Marlin and Nemo are a new set of characters who prove to be every bit as memorable. 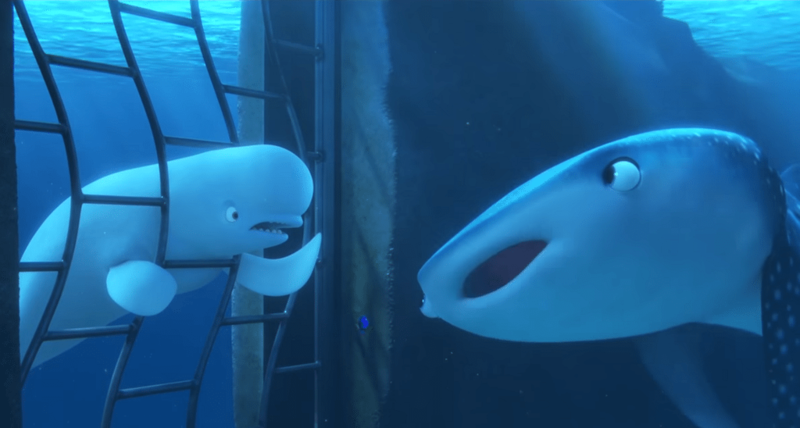 A near-sighted whale shark named Destiny (Kaitlin Olson) and a worrying beluga whale named Bailey (Ty Burrell) are old pals of Dory (explaining her ability to “speak whale”), while a trio of sea lions provide some great comic relief, as they obsess over sleeping on a rock. 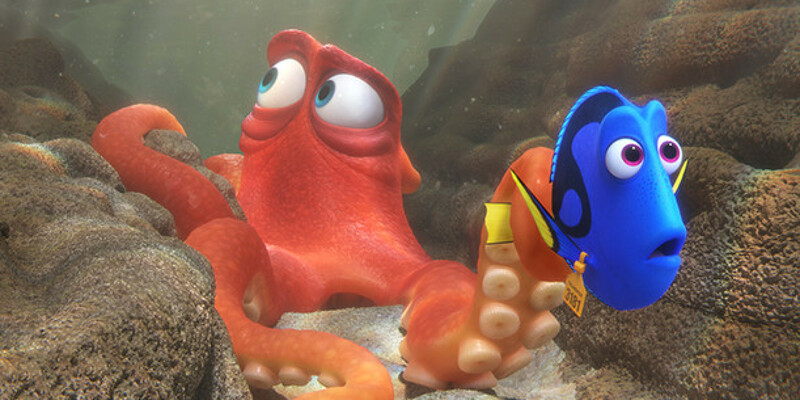 The main new addition, however, is an octopus named Hank (Ed O’Neill), whose bitter and curmudgeonly nature make him a perfect new foil for Dory, as Marlin’s role in the film is reduced. As you might expect from a Pixar film, Finding Dory is beautifully animated. The characters and environments are all wonderfully constructed, with the ocean segments capturing a similar realism to that of the first film, while the events of the marine life institute give a whole new visual life to the franchise. Hank alone is one of the most detailed animated characters in recent memory, as his squishyness and tentacles give him unique movements, and his ability to camouflage providing some great visual gags. Finding Dory also boasts an almost-surprisingly terrific musical score. Finding Nemo similarly had a beautiful soundtrack, but what stands out about Finding Dory’s score is how rarely it falls back on old tunes, instead building an identity of its own with its music, which is no less beautiful than it was in the first film. Some may lament that many characters from the Finding Nemo – such as the sharks – are absent, but in the end it works for the best. Finding Dory manages to tell a story of its own instead of simply pandering to our memories of the original, as so many sequels do. Finding Dory has a heart, and a lot of it, which is certainly more than you can say for most sequels. It not only builds on its leading character beautifully, but it also has something of its own to say. While Finding Nemo was all about a parent’s love and devotion to his son, Finding Dory is a story bout living with, and dealing with, disability. This makes Dory thematically unique to Nemo, and furthers Pixar’s ability to tell a wide range of stories. Perhaps Finding Dory’s greatest accomplishment, however, is how it takes such little details from its predecessor and turns them into not only a compelling and worthwhile sequel, but one of the best sequels in recent memory. It takes a number of cues from its predecessor, but its best bits are those that are its own, or the small things from the original that it turns into something more. This speaks truest for its heroine herself. Dory was always the most remembered character from Finding Nemo, but with the newfound depth this sequel gives her, she’s downright unforgettable. 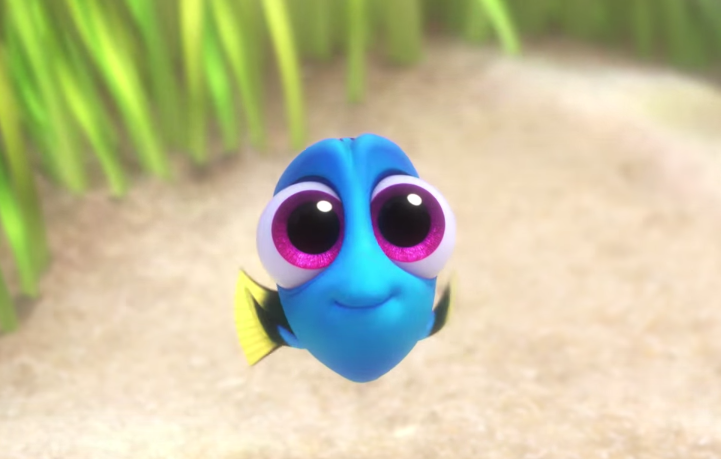 Baby Dory: The most Adorable thing That Has Come to Be (Besides Kirby). Great review! I thought this movie was great. Not only that, but it fleshes out Dory as a character PERFECTLY. I love it when Comic Relief characters have depths to them, since I feel that’s very, VERY important when it comes to writing a character, other than the obvious personality, growth, and development. When I first heard about it, I was like: “No way, really? There’s no way this will work.”. Looks like skeptic me was proven wrong once again. As for my opinions on the new characters, I think they’re really good characters as well, my favorites being almost all of them, Destiny and Hank in particular. And finally, BABY DORY IS SO CUTE AGH MY HEART CAN NOT CONTAIN THE EMOTIONAL INTRO OH MY GOD IT MADE ME CRY JUST LIKE “UP” ALL OVER AGAIN. I saw this movie for myself, and I enjoyed it immensely; it’s tough to make a sequel to a beloved film 13 years after the original, but Pixar found a way. Amazing, isn’t it? This could quite possibly be the only instance that I know of when switching to the perspective of someone who was a comic relief character in the preceding installment worked extremely well. When I think of the many times people have tried to do this and failed (even Pixar isn’t immune), it’s quite astonishing. 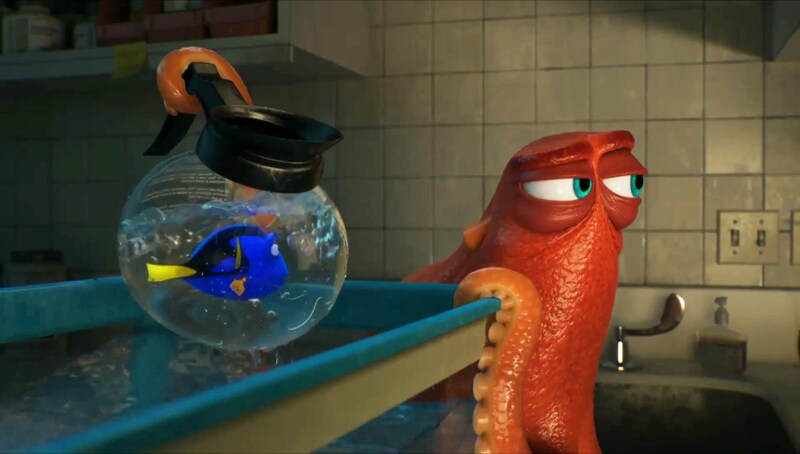 Finding Dory is an excellent movie that does a great job in fleshing out a side character and shaking things up in relation to its prequel while not losing the ties that connect it with the original. This is the Pixar I know and love! It’s great that Finding Dory succeeds where Cars didn’t. I don’t mind them delving back into older properties as long as their stories can hold up the established characters. Great review! Finding Nemo is by far a favourite of mine in regards to Pixar’s repertoire, and while I didn’t enjoy it nearly as much as you did, I was satisfied by its implementation. I’m someone who didn’t even want a sequel in the first place, I thought Nemo’s story and universe was excellent on its own. I will say, I am impressed that Pixar managed to take a character element such as Dory’s short-term memory loss and utilize it in a more predominate, but never frustrating manner. What was once a comical element of the original is given the spotlight this time around and we truly empathize with how it effects Dory to a whole new extent. But as someone who hasn’t watched Finding Nemo in over half a decade, I couldn’t help but feel that certain elements strayed too far on the familiar. In terms of animated releases of 2016, I personally felt that Zootopia was vastly superior in almost every way. But then again, Finding Dory had the insurmountable task to live up to and fill in the gargantuan shoes of Finding Nemo, so perhaps my criticism is unjust and a little too harsh.